MISSISSAUGA – Safe City Mississauga, a non-profit charitable organization, is committed to delivering crime prevention programming and events to the city of Mississauga. 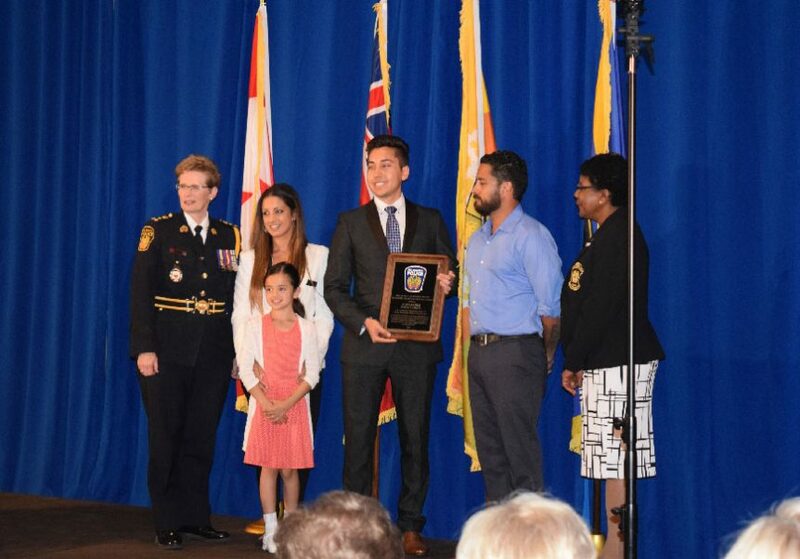 Safe City Mississauga staffer, Alex Papatchidis, has been named as the recipient of the Detective Robert Boyne Memorial Crime Prevention Award by the Peel Police Service Board. The award was presented to Mr. Papatchidis on June 23rd, 2016 at the Mississauga Convention Centre by Chief of Police Jennifer Evans, Peel Police Service Board Member Norma Nicholson, and the family of the late Detective Robert Boyne. “It’s an honour to be this year’s recipient of the Detective Robert Boyne Memorial Award”, says Alex Papatchidis, Neighbourhood Watch Program Coordinator and Staff Criminologist, Safe City Mississauga. “We’re always looking to improve our services and programs to better serve the community, so I think this is a sign that we are continuing in the right direction”. The award recipient is selected for demonstrating exceptional initiative and commitment to the concepts of crime prevention, an ideal which is highly valued by Peel Regional Police. This is the fourth time since the inception of Safe City Mississauga in 1992 that a member of the organization has been recognized for their contributions to the crime prevention sector in the Region of Peel through the Peel Police Services Board Annual Awards. “We values the relationship we have with Peel Regional Police, and to have a staff member selected for this award truly shows the dedication our team has in making Mississauga a crime-free city for all” says Sheena Moya Chen, Executive Director, Safe City Mississauga. Safe City Mississauga is a registered charitable organization founded in 1992 to help reduce criminal opportunity and criminal victimization in Mississauga. We provide resources, staff, professional community leadership and guidance for crime prevention programs and activities; encourage crime prevention education within the public, private and voluntary sectors; and research, develop and implement new community crime prevention programs and activities. Put simply, we want to stop crime before it starts.